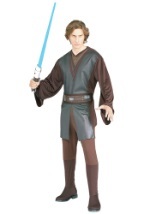 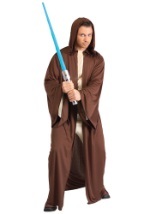 Anakin Skywalker may be famous for his podracing skills, but he can hold his own with a lightsaber too! 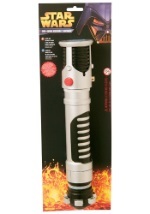 This authentic-looking lightsaber resembles the one the Jedi used in the hit Star Wars movies. 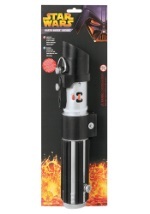 The silver plastic lightsaber has raised black grips on the hilt, as well as various control buttons. 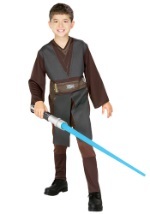 (Control buttons for show only; they do not affect lightsaber's performance) A light blue plastic extension is pulled out from inside of hilt to form the blade. 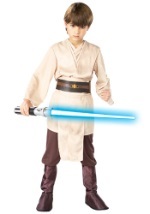 With the blade extended, the lightsaber has a total length of more than 3 feet. 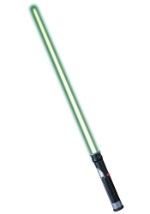 When the hilt's power switch is turned to the "on" position, the blade lights up. (Lightsaber requires 2 "AA" batteries, not included) When you are done using lightsaber, simply push the plastic blade back into the hilt for easy storage.